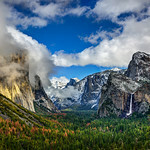 "Milky Way over Half Dome"
I am excited to introduce my newest Yosemite image! 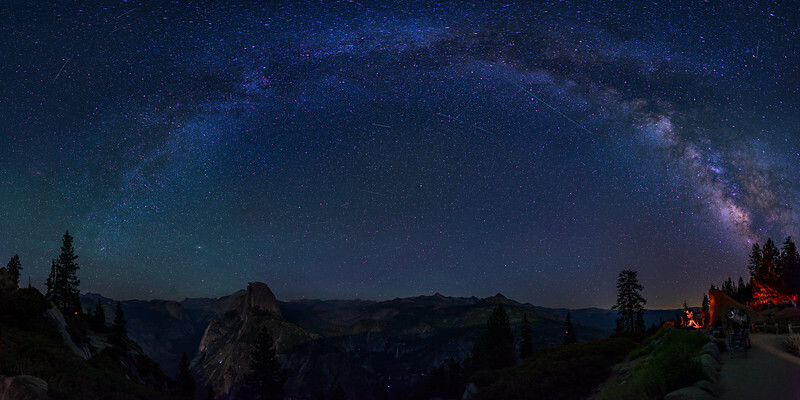 This image is a 20 shot panorama captured this summer from Glacier Point as the Perseid Meteors were flying over head. There are about 15 meteors shooting all over the place! One single shot had 5 meteors in it that I didn't realize until I got back. The best was the green streak of a Perseid meteor that went right off directly in front of me! (most meteors seemed to zip off where I didn't have my camera pointed.) The night was warm and clear as the Milky Way and other galaxies were right in front of me. It was absolutely amazing! There were hundreds of star gazers up on Glacier Point with people of all age ranges enjoying the show! The astronomers setup their telescopes with red lights to keep people from tripping over the legs of the tripods. Photographers were wearing red lights as well to keep their eyes adjusted correctly. 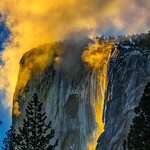 We watched the procession of hikers coming down from their day on Half Dome as flash lights could be seen coming along Vernal and Nevada Falls. There are a few climbers coming up the face of Half Dome as well.